A Case of the Runs: Insanity - Week 3: How Hard is It? This entry marks the end of the third week (actually, I'm on Week 4, Day 2, but who's counting?!) in which I have been doing these Insanity workouts. That means that a third of the program is done, and by now, I know the workouts pretty well. In this update, I want to elaborate on the question of "How hard is it?" for people who haven't tried this workout yet. 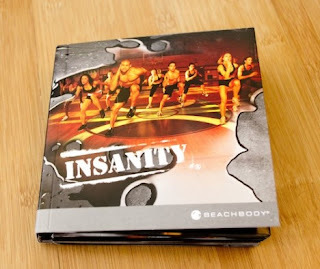 Anyone who has seen the infomercial can probably recall a ripped Shaun T (the instructor) sweating like crazy, and according to "The Ukrainian"'s brother, you're spending half the time kicking your knees to your chest and going, "Shoop, shoop!" That desciption is... mostly accurate. The workouts so far are around 40 minutes and involve a "warm-up" sequence that is repeated a few times, a period of stretching, a workout period, and a cool-down period. The "warm-up" alone will get you sweaty and tired, and yes, it does involve lifting those knees a lot. With your core, of course. I've been doing the workouts in socks atop carpet and yoga mats, but I think it could be easier to lift my knees and jump in shoes and on a surface like a gym/basketball court floor like what they have in the video. Without that, there's no extra little "spring" in my step, if you know what I mean. After the "warm-up," he spends a good chunk of time stretching the legs and hip-flexors, and by this point, you're wiping sweat as you're doing them and relish these moments before what's to come. Thankfully, by the time the stretches are over, you've got like 22 minutes left in the workout -- you can see it in the progress bar at the bottom of the screen -- but 22 minutes is certainly enough. The workouts consist of a lot of high-speed football-esque drills. My track and field coach (RIP) was also a football coach, so we did lots of this in high school, only not so quickly or for that length of time. There is some repetition in the moves, but I try not to think about it since it all goes by pretty quickly. In most of the workouts, he goes in intervals and gives you 30-second breaks, with the exception of the "Pure Cardio" disc in which you don't really get a break. Nonetheless, the whole thing goes by pretty quickly, and by the end, you're covered in sweat and actually feeling pretty good if you have not thrown up. Word to the wise: allow your food to digest before doing these workouts. Risk of puking is definitely there. Each workout was pretty tough in the beginning, and guess what?... they are still tough. In the first few days, I was constantly sore, and then I stopped getting sore but still sucked/dragged during some of the workouts. Some days, it's hard to push, especially through some of the jumps. So although it does get easier, it is never perfect. Even the people in the video, who are pretty darn fit, are dropping like flies in some of the videos. In the second month, which is somewhat on the horizon, the workouts are longer and tougher, so I'll be sure to elaborate on those later. A part of me is scared, but mostly because I'll have to wake up even earlier (by 15 minutes or so... no biggie... and endure for 15 more minutes, which I'm not sure is going to be easy when 40 minutes is already no cakewalk. With that said, you should try it if you have any doubt... see if you have a friend who is not using their DVDs for the time being (it seems that once you complete the 63 days, a rest should be taken before starting again... perfect borrowing time!)... or maybe there are clips on YouTube. Bottom line... so far, I am finding these workouts very hard, but do-able. And folks, I ain't that fit. Finally, here are my Fit Test results after two weeks. No, that's not a typo on the first exercise... I think sometimes it's hard to keep the form correct and when I'm more correct, I do less than when I'm less correct. I worry that I will not see more improvement in future Fit Tests, as it's still pretty hard and I feel as though I'm already pushing the limits of my abilities. Finally, I have a marathon this upcoming weekend. Yeah, I know. I'll talk about the running+Insanity combo later, but I fully know that I haven't spent a lot of time running lately besides the 15-miler I did. That's actually longer than I went for my last marathon training, but my initial impression is that Insanity has not increased my endurance and has also made my feet hurt when I'm running -- but then again, I'm lighter on my feet as a whole. This should be interesting. I have a tough time sticking to these kinds of programs. I think the initial soreness makes me not want to continue. Yeah, around the 2nd third of the program is when I started feeling burnt out using it. I'm starting it again soon as a result of these posts you do. I'm thinking do it in the morning then weightlifting at night. Man, that's going to be bananas.